Who Do You Want to Provide Your Energy Services in the Future? consumers may buy energy services in the future. Historically we think of buying our energy services from our local electric and gas utilities. That is, of course, if we even think about the commodity we buy as a service. In some states, consumers have gained experience with energy retailers through deregulation of the commodity function, allowing service providers to sell gas or electricity directly to consumers. Although consumers probably haven’t thought much about future energy services, many energy insiders envision a future world where energy services may become as diverse and numerous as services for your cell phone or multimedia delivered via your internet connection. 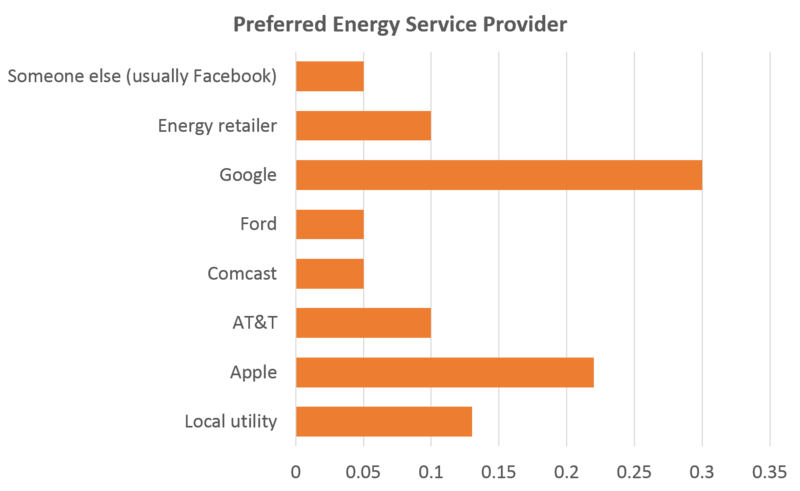 For electric services you might buy in the future, from whom do you want to buy them? This suggests that utilities may fair best by finding ways to partner with consumer-oriented technology companies that are known and trusted by consumers. Who do you want to provide your future energy services? Share your thoughts in the comments section of this blog post! This entry was posted in Electricity, Energy Training and tagged Energy Retailers, Energy Services, Future of Utilities. Bookmark the permalink. 1 Response to Who Do You Want to Provide Your Energy Services in the Future?